I’ve been working on a little utility to experiment with the XMPP protocol. 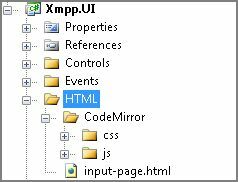 The idea was to write a tool that would allow me to send, receive, and display the XML stream and XML stanza messages at the core of XMPP. Of course, I could have implemented it using a simple multi-line text box for the XML entry, but that would mean that I wouldn’t have nice things like syntax highlighting (for XML) and nice (auto) indentation. On the desktop, I’m not familiar with any free Windows Forms editor controls that are capable of syntax highlighting. But on the web side, there are several free, open source script libraries at our disposal. For example, CodePress, EditArea, and CodeMirror. I chose CodeMirror for this application as it was the simplest library that met my needs.